"At this level, it's not so much physical, it's mental... and, the ones who are stronger mentally, are the ones who usually win in a physical contest." This disc is an excellent additon to the library of fans of professional football. Focusing on the players that have been inducted into the Hall of Fame, the presentation uses the achievements of this elite group of players spanning the entire history of the game as a light with which to illuminate the elements that make athletic achievement at this level an example of the reach of human beings. The material here will be enjoyed by all ages and will no doubt provide much fodder for discussion about the relative greatness of favored players. 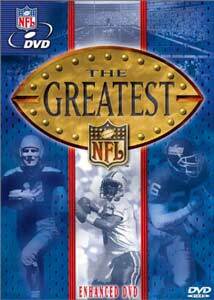 Following a nice little montage introduction that features famous football quotes, this documentary moves into segments about the greatest players and plays in NFL History. It is interesting to see the changes over time in the game and listen to comments of the actual players. I can remember back long before the advent of DVD, VHS and even cable TV that such information was found in books and as a child, I loved to read about the exploits of players from the early days of pro football. There is just a fascination to the see how much the game has changed over the years, yet to see how much it is the same. Much of this documentary talks about the fact that the game of football is made up the men who play it. To have the actual players talking about their experiences and to see footage of their greatest plays is a fantastic bonus. The Resume Play: Certain players are remembered for one magic play that defines their essence. Here several greats talk about plays that they remember as their best or most exemplary, such as Franco Harris and the "Immaculate Reception." Pioneers: This section looks back at players who invented or changed the game as we know it. Playing in an era of small money and small crowds, they set the standards of toughness and excitement that help football grow into the national sport it now is. Great archival footage is found here. Intimdators: Some players have achieved legendary status for their tenacity and ability to strike fear into their opponents. A large part of football is the aspect of controlled chaotic violence; these players skirt the boundary of mayhem more spectacularly than most. Heart & Soul: Some special players achieve greatness through their strength of character or desire, especially in impossible situations. These men exemplify that aspect of the player whose standard raises the level of his teammates through his own efforts. Big Gamers: There is a magical part of being a winner that is defined by the mystical term, "gamer." A gamer is someone who consistently rises above the limitations of the situation and his own abilities to reach for greatness. Here we meet and rmember some of the great "big game" players for their way of rising to the occasion. Game Breakers: Interspersed among the tedium of constant collisions and dives into the line are the big plays. These are distance runs and long passes that in the blink of an eye change the whole complexion of a game. Some players achieve the status of "game breaker" by existing as a constant threat to go all the way for a touchdown at any time. Underdogs: Every one loves an underdog and here we see some of the players that overcame great odds to become Hall of Famers. Future Hall of Famers: Even today there are players who are making their mark as some of the greatest to play the game. This section looks at players today reflecting on the achievements of their predessors and notes some who are headed for the Hall of Fame. The First Pick: In this section, the Hall of Famers tell who, of all the players of history, would be their "first pick" in the ultimate game. This disc provides a nice balance between entertainment and reference. The documentary is nicely edited and makes for compelling viewing,. Exploration of the Gallery of Greats and supplementary chapter material leads to interesting footage of other Hall of Famer's not featured in the documentary, and will provide hours of entertainment for football fans interested in the history of the game. There is no doubt that NFL Films has achieved a level of greatest in their own right that, like many of the players in this show, sets standards for others to follow. From the unique perspective camera shots to the crunching of the soundtrack on the big hits to the Olympian tones of the narrator, their presentation have a memorable and instantly recognizable quality. Image Transfer Review: The image transfer is a typically good NFL Films project. They do an amazing job of intermixing the archival film footage, photographs, TV clips and their own unique obtained shots of the game. The show looked great. Audio Transfer Review: The nicely enhanced Dolby Digital 5.1 soundtrack on this disc provides expanded sound and lends the presentation a more theatrical quality. As usual, the NFL signature sound design is excellent and this disc shows it off with great flair. Extras Review: Gallery of Greats: This extra section provides access to further information about the Hall of Fame players featured in the documentary. The first screen gives listings by position, alphabetical and by teams. This provides another way of viewing the material in the documentary and is quite interesting. Choosing "Quarterbacks" and then the name of a player will provide a career capsule, the player's bust from the Hall of Fame and access to sections of the documentary in which the player was featured. If not found in the documentary, there are archival clips featuring groups of players. It is often fascinating to look at the context and careers of some of those with names that are not as familiar. Supplementary Chapter Material provides different and interesting looks at aspects of the game and is available as additonal options in the chapter menus or by pressing enter when a special icon appears during the section. These supplements take this disc beyond merely a retread of a television documentary to a resource that has legs for continued viewing and won't end up gathering dust on a shelf. Fans of all ages will find much to enjoy on this disc. Not only is there a fine documentary about the greatest players in the history of pro football, but there is copious extra material that provides information about every player in the game's Hall of Fame.